I adore homemade soups. Growing up, most of our soup was from a can, but occasionally my mom would make a big pot of homemade soup. And I always loved it. 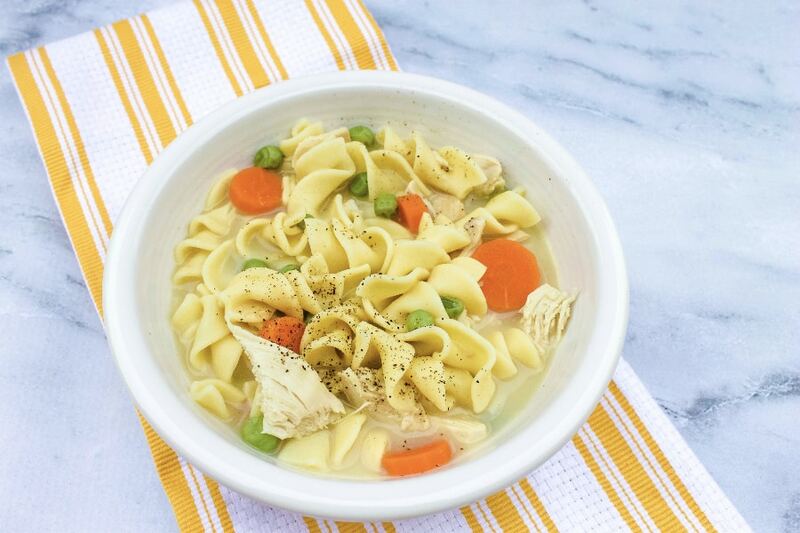 Homemade soups are just heartier and full of flavor. As a young adult, I also typically ate soup from a can. I didn’t really know how to cook much yet, and canned soups were a quick and easy meal. But they just weren’t the same as a bowl of homemade soup. I didn’t know it at the time, but homemade soup is also much cheaper than canned soup! 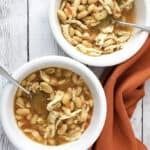 Over the years, as I started cooking more and trying to feed my family on a budget, I learned how to make several different soups. 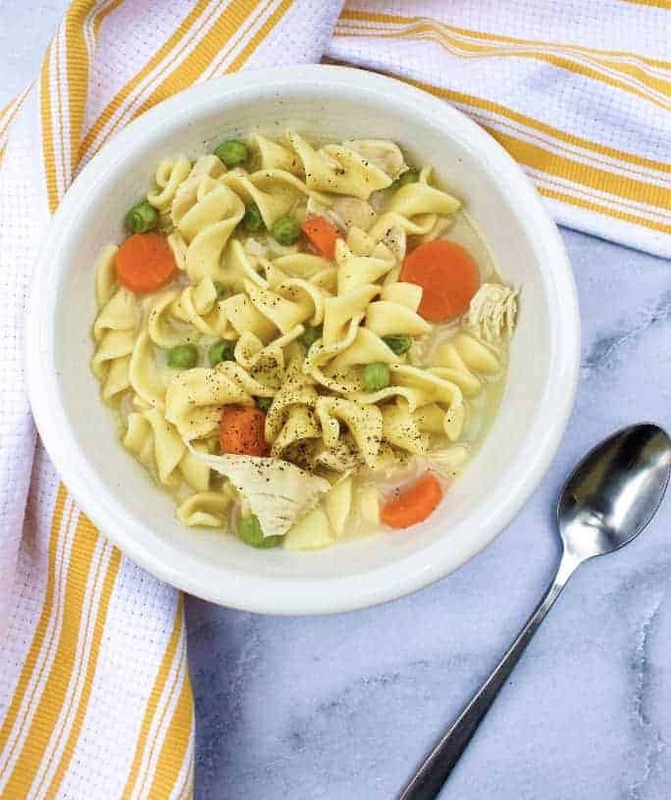 I’m constantly experimenting and trying new recipes to add to my repertoire, and this creamy chicken noodle soup in the Instant Pot is one of my recent loves. 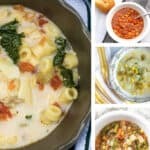 This creamy chicken noodle soup isn’t a really thick creamy soup–it’s a thinner, creamy broth that I like–similar to this Instant Pot zuppa toscana. That way it still feels like comfort food, but it isn’t super heavy. I adapted this recipe from a stove top version I found at Good Cheap Eats. 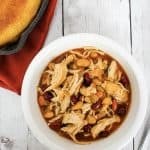 I wanted to simplify the preparation a bit by converting it to a pressure cooker recipe. It worked beautifully! You’ll start by cutting up a couple of boneless, skinless chicken breasts. Cut them into 2-3 pieces each, so that the pieces are fairly uniform in size. 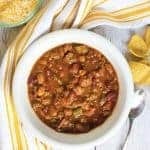 Place those in the insert pot of an Instant Pot. Next, add in the noodles and pour broth over everything, making sure the noodles are completely covered with liquid. 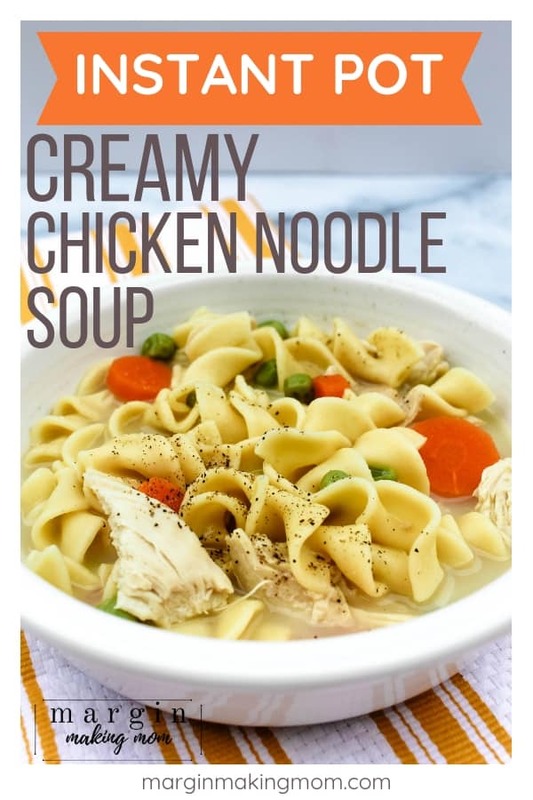 If you need to, poke some of the noodles down into the liquid. Top with peas and sliced carrots. Lock the lid into place and cook at high pressure for 4 minutes, followed by a 10 minute natural release of pressure and then a quick release of any remaining pressure. After the pressure has released, remove the chicken and shred or chop as desired. Return it to the pot. Then add in some cream of chicken soup. 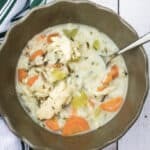 I use this super quick and easy homemade cream of chicken soup because it’s a cinch to make and it’s full of flavor, plus it’s just better for you than the canned stuff. But you can also sub in canned condensed soup mixed with water if you prefer! Allow that to heat through a bit, then stir and enjoy! One of the things I love about homemade soups is that they’re pretty much endlessly adaptable. Feel free to change up the meat or veggies! Need to use up some leftover Thanksgiving turkey? Toss that in instead of the chicken breasts. You can also use rotisserie chicken that’s been pulled from the bones. Even though the turkey and rotisserie chicken are already cooked, you can use the same cook time so that the noodles will cook adequately. You can use different pasta besides egg noodles if desired. 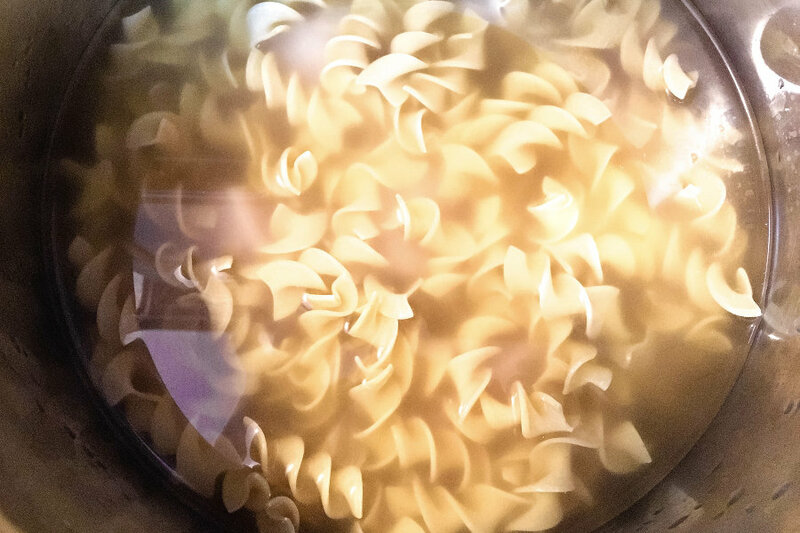 Elbow macaroni, rotini, farfalle–take your pick! 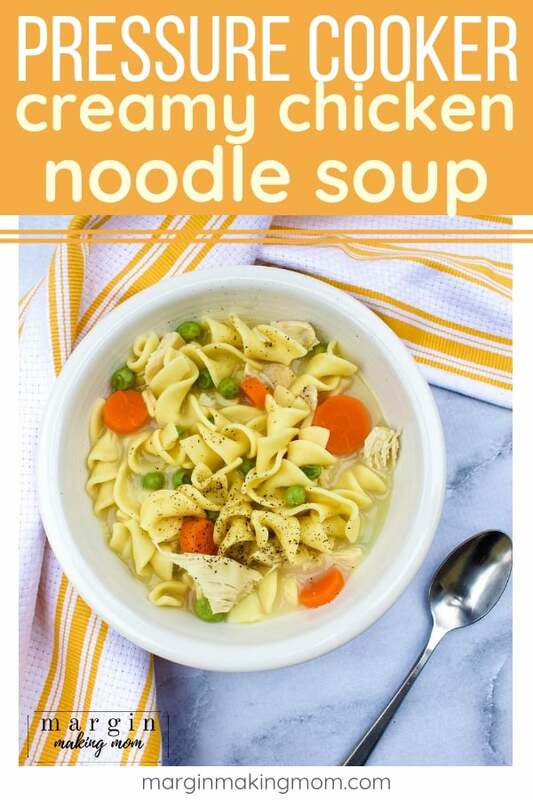 I highly recommend using homemade cream of chicken soup for this recipe–it is really simple to make, trust me! 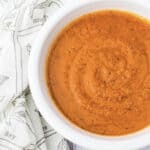 If you use a canned condensed soup instead, you may need to tweak the seasonings a bit after it has cooked. You can freeze the leftovers. The texture will be a tad different after freezing (the noodles may be a bit softer), but I reheated it and thought it was still very yummy! 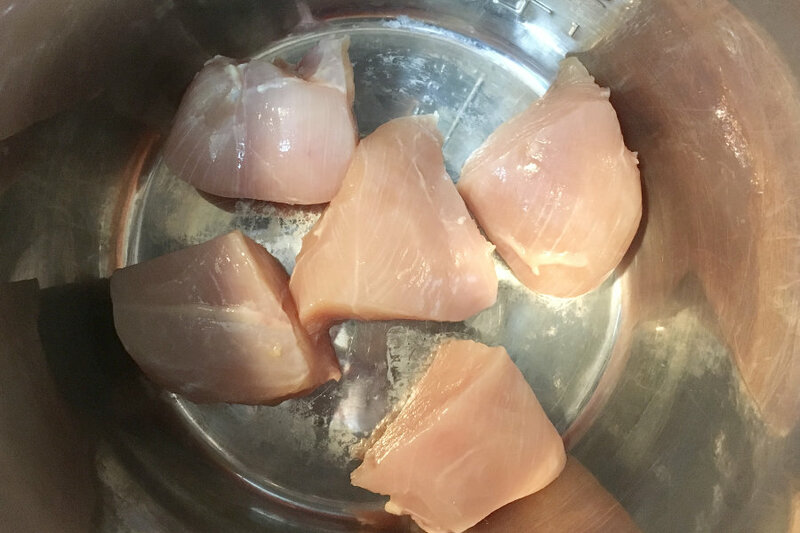 In the insert pot of an Instant Pot, place chicken pieces. Top with egg noodles. Pour broth over everything, making sure that the noodles are completely covered with liquid. 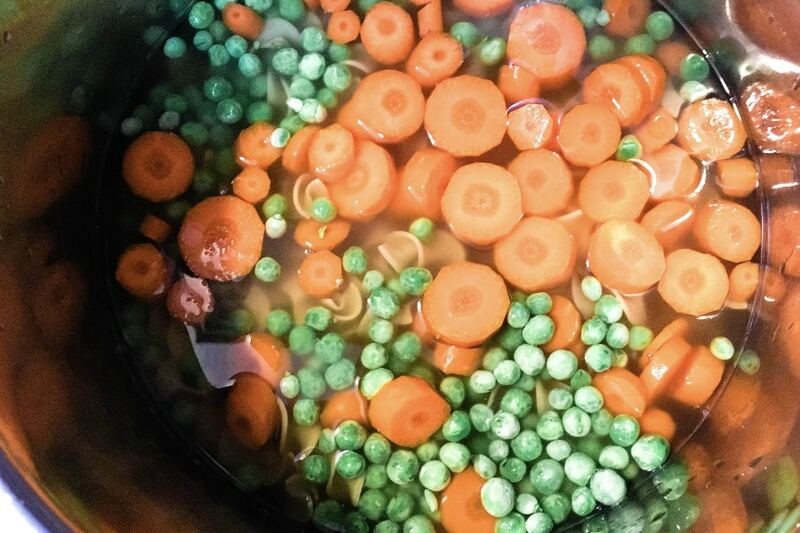 Add sliced carrots and frozen peas on top of the noodles. Close lid and set vent to the sealed position. 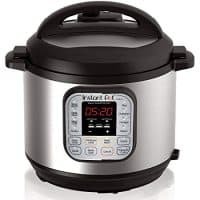 Select a cook time of 4 minutes at high pressure using the Manual/Pressure Cook button. When the cook time is complete, allow a 10 minute natural release before performing a quick release of any remaining pressure. Once pressure has released and the valve has dropped, carefully remove lid. Stir contents and remove chicken chunks, shred or chop as desired and return to insert pot. Stir in cream of chicken soup until well combined. Add salt and pepper to taste.